Today’s offer: Get smooth skin and save £50! Veet specialise’s in products to remove body hair as easily as possible leaving your skin silky smooth. So today’s the day you should take advantage of this set of goodies on offer for a fantastic price. 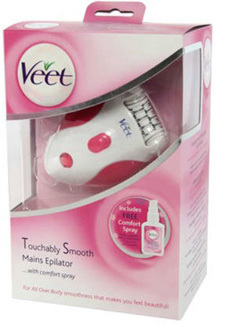 The collection starts with Veet Touchably Smooth Mains Epilator – it has 2 settings and removes hairs for up to 4 week. Result! The set also comes with Pre-epilation Comfort Spray, which reduces the discomfort that comes with hair removal, a epilator cleaning tool and it can all be tucked away in the pink, waterproof storage pouch. Originally £59.99, this steal is only £19! Offer ends shortly so grab it while you can!